Scottish universities face a trying time ahead. Digital transformation has seen the higher education sector disrupted by new technologies and rising expectations from students to deliver more in return for their high tuition fees. Combined with an influx of competition in the market, universities need to work harder to meet demanding recruitment targets and attract talent from around the world. Honing a comprehensive holistic search strategy is crucial to helping higher education institutions achieve these goals. Investing in search engine optimisation (SEO) and paid media will ensure a strong digital presence and drive more traffic to each university’s website. To assess the current state of play, Storm ID are proud to present our Holistic Search Analysis of Universities in Scotland. Before we take a closer look at the study, let’s clarify what we mean by “holistic search”. We define it as the unified approach to paid and organic search that combines to occupy as much space as possible in search results. By targeting relevant keywords through SEO and PPC, holistic search earns more qualified traffic for your site. Working in tandem, paid and organic search can complement one another. Enhancing pages with SEO can lead to improved paid search Google Quality Scores, while paid search can be used to test different messaging for SEO content. The presence of both paid and organic search results has also been proven to increase brand trust and increase the likelihood of conversion, amongst other benefits. 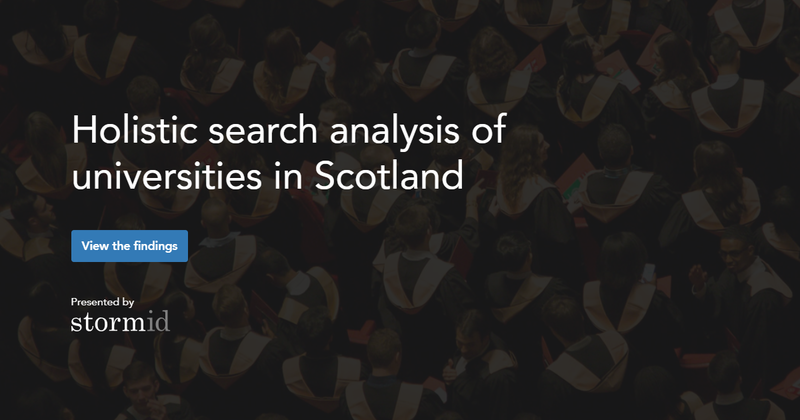 With a goal in mind, we undertook in-depth holistic search analysis of 15 universities across Scotland. To analyse SEO performance, we audited each institution by emulating a search engine crawl, as well as manually assessing each website. This allowed us to determine how well each site adheres to best practice and its relevance to user search queries. The results of the audit are based on a 25 point scale. To evaluate paid activity, we used search tools like SpyFu and SEMrush, as well as performing manual searches to determine which keywords each university is bidding on and what ads are displayed. This enabled us to get an overview of each university’s paid search approach. The results highlighted that all universities have significant room for improvement when it comes to holistic search. The SEO audit in particular provided the most detailed breakdown of opportunities, with the average score sitting at just 8 out of a possible 25 points. Queen Margaret University had the highest score of 15, while Glasgow Caledonian University had the lowest score of only 4 points. Our research uncovered that every university had issues with visibility, which is harming their indexation in search results. 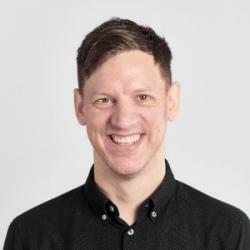 The most common culprit for this is a lack of canonicals across the sites, which means they are not protected from the risk of duplicate content and may suffer from inflated indexation. All analysed universities also lost points for content elements, such as missing and duplicate meta data. Mobile-friendly sites are more important than ever, as Google now indexes mobile pages first. While each university passed the mobile-friendly test, most failed the recommended mobile page speed of under 5 seconds. Edinburgh Napier University scored the worst with a load speed of 15 seconds, while Heriot-Watt University, Robert Gordon University, the University of Edinburgh, and the University of Glasgow scored the best with a page speed of 4 seconds. As mobile page speed will become a ranking factor in July 2018, it is vital to have a site that loads quickly. Our paid search analysis uncovered that almost all universities are using paid media as part of their digital strategy, however the University of St Andrews is not and Robert Gordon University lacked sufficient data to assess. While we discovered active keywords for most institutions, we could not find Remarketing or Optimise tags for the majority of them. This highlighted the need to follow paid best practice to ensure budget is not wasted and targeting is used effectively. Attracting international students is crucial for Scottish universities, as they generate a wealth of income from tuition fees. In fact, students from overseas accounted for £3 billion worth of revenue in 2012-13 and thus, make a major contributor to the bottom line. Developing an effective holistic search strategy will help to ensure visibility in foreign countries and attract new students. Holistic search also maintains a consistent approach to digital marketing across the many faculties universities are comprised of. With multiple marketing departments across these faculties, universities may end up competing with themselves in search by targeting the same audiences. A solid holistic strategy will tackle devolved approaches to marketing and ensure effective use of time and ever-important budget. Keyword research will also help to guide targeting and take account of the most appropriate way to reach your desired audience. What’s more, adopting a holistic search strategy will ensure universities are ready for peak times of the year, such as clearing. Planning an effective paid campaign around this highly competitive time could be the difference between attracting a cohort of students and losing them to another university. Holistic search can also facilitate a cross-media remarketing approach on social media to engage with prospective students at the right time. Refining an extensive holistic search strategy is an essential part of digital marketing for universities. Our study has highlighted an array of opportunities for improvement, which higher education institutions can capitalise on to improve their digital footprint and combat digital transformation up front. If you would like to find out more information about our research or have any questions, please do not hesitate to get in touch.